This guide was created by Amplirage, really good job! The Invoker, his name portrays the raw elemental firepower that this mage can harness. Be it casting devastating spells that turn tables of battles or empowering himself with the fury of the elements, the Invoker is not one to by trifled with. Foes who stand up against him are brought down by his sheer power and combinations of devastating spells capable of destroying even the strongest and toughest warriors. Cowards who run are sent to their makers with a sudden gust of fearsome wind or an explosion of solar radiation. Commanding the power of the elements, Fire, Ice and Lightning, the Invoker brings opponents to their knees in seconds. This hero made his first appearance in DotA some time ago as a very Imbalanced hero. He had a HUGE arsenal of spells at his fingertips. This was good and bad at the same time. Icefrog removed him and promised to remake him. Now, he is back, more balanced but still very powerful. 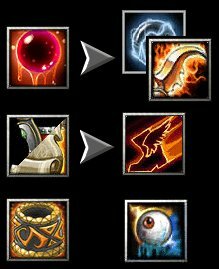 The Invoker is by far one of the most versatile heroes in the game. He can be the team’s DPSer, Caster, Ganker, Pusher, heck, he can tank quite a lot of damage too with his insane hp regeneration. His movement and attack speed can also bee boosted to suit your every need. Last and most important, he has a damage booster that can really turn him into a fearsome DPS caster that can out-match even some of the heroes that were made for DPS themselves. This is all good but there is a catch. Mastering the Invoker takes time, patience and micro skill. Do not get frustrated if you do not get the hang of him at the first few tries. This is what my guide is here for. My aim this time is to unveil the secrets of the Invoker to all players, pro and new players alike. Now, without further ado, I present my guide.